Calxeda is not resting much after the release of their first chip, today they are talking about their new A15 based “Midway” ECX-2000. Not only that but the company has released a whole host of roadmap updates to go along with it. Today’s biggest news is that the old A9 based ECX-1000 is now ‘outdated’, replaced by the A15 based quad-core ECX-2000 that was formerly code named Midway. It was almost two years ago that the company first talked about their ECX-1000 chip, and a little less than a year later you could play with one on the net. A bit more than a year later the successor is a real chip, and the future looks like this. This rather simple diagram is apt because once you start peeling away the layers of the onion, there is a lot of interesting stuff lurking. 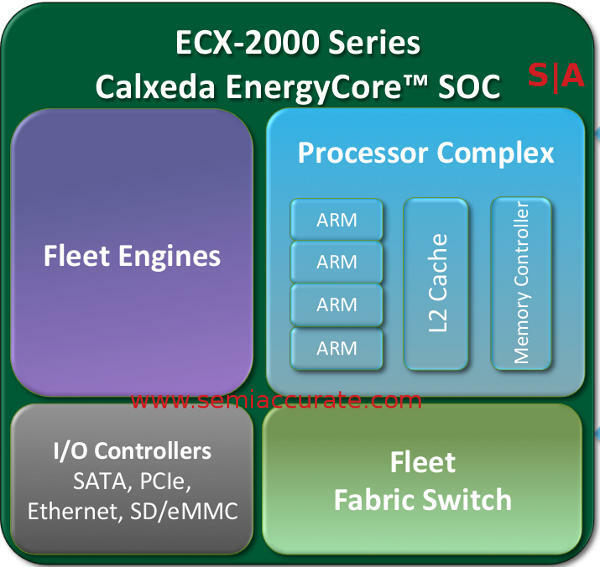 As of today Midway is the A15 based ECX-2000 and Sarita is probably a year away from release if Calxeda’s cadence stays on track. They claim 64-bit capabilities and ~50% more performance so that would be an A57 based part barring an internal core. Given how large Calxeda is that is a very unlikely scenario, put your money on a vanilla A57. One thing that most observers don’t get and Calxeda is rather reticent about proclaiming is that the first three generations of their SoCs are pin compatible. If you have an ECX-1000 board and want more performance, you can just slap a Midway in and update the BIOS. Sarita should work the same way, this is a massive boon for hardware designers and other early adopters, Calxeda did right here. It shows that they are thinking both long-term and with the right mindset for server customers. One other thing the ECX-2000 brings to the table is a new version of the Calxeda fabric, something SemiAccurate told you about in great detail last June. This new fabric both simplifies the cards by putting SATA on the backplane, this simplifies system design and wiring too. Better yet a clever OEM can pool or virtualize storage like SeaMicro does. In short it is a win/win for hardware vendors and customers alike, there is almost no downside here. Lago and Ratamosa are not pin compatible with Sarita though and there is no word about being compatible with each other either. In any case if you look at the tech Calxeda is calling out for Lago it looks like the Fabric is going to be completely new and memory subsystems upgraded to support the increased performance. The enterprise bent of Ratamosa also suggests that it will support more RAS features as well. So what does the ECX-2000 bring to the table? It is a quad-core A15 with 4MB of L2 cache, five 10Gbps fabric links, three 10Gbps ethernet links, and supports DDR3-1600 memory. 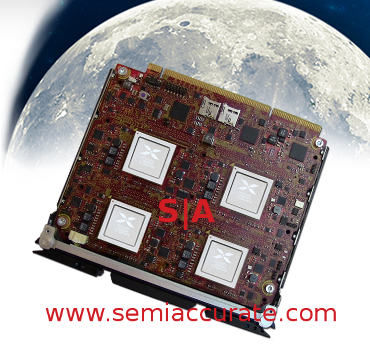 The SoC runs at 1.8GHz and has a typical power use of 11W or a TDP of 14W. For I/O the chip supports SATA 3Gbps, a PCIe2 8x slots, and other misc housekeeping I/Os, and a fabric switch to make sure everything goes in the right direction. So far, so typical. The block that says Fleet Engines changes all of this. That block is code for a dual core A7 processor and more unspecified functionality. One of the A7s is for system management, power management, and remote control/OS management tasks. In case you missed the part about this being a full A7, this management block is rather programmable and a bit more powerful than the typical microcontroller roped in to this task. Once again you might recall that this is a dual core A7 and one of them is used for management so what about the other? That is up to you and once the enterprise guys get their dry and boring mitts on this, expect some potentially killer apps. At least that is the rosy outlook but we will stick with that.